Relieve pain under the ball of your foot! 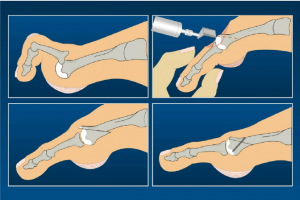 Dr Knox performs surgical treatment in Perth to alleviate pain related to metatarsalgia (pain under the ball of the foot) and painful plantar callus formation. 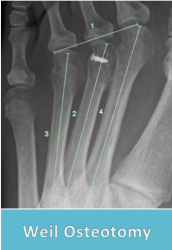 This procedure known as the Weil Osteotomy involves making a cut (osteotomy) through the metatarsal bone and realigning it in respect to the adjacent metatarsals. The procedure generally takes place on a day surgery basis under general anaesthesia, and patients are required to wear a splinted post-op sandal for 2-4 weeks after surgery. Immediate weightbearing is permitted after surgery, and patients generally resume normal activities several weeks after surgery. For more information on metatarsalgia surgery in Perth, we recommend making an appointment to see our specialist podiatric surgeon Dr. Andrew Knox.